MIAMI — Pinned down by gunfire in Ambush Alley, Army Staff Sergeant Greg Reynolds thought he surely would die in the desert dust on the road to Mosul, Iraq, in 2003. But the Dighton, Mass., native survived — only to have his left arm sheared off five years later in a motorcycle/car accident in Swansea, just miles from his home. The other driver, James Viera, 75, a Korean War veteran from Tiverton, R.I., was unhurt, but Reynolds’s injuries were horrific. He would not return for his scheduled second tour of duty in Iraq. The chiseled, 175-pound soldier teetered between the here and the hereafter. He was in a coma for six weeks and dropped 65 pounds. When he awoke, he didn’t know who he was, where he was, or what had happened. But this is not a story of darkness. Reynolds, now 28, beat back his demons and came out stronger at the broken places. 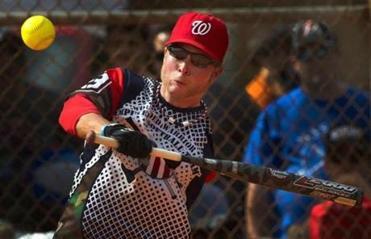 Now he is the starting left-center fielder for the Wounded Warrior Amputee Softball team, a collection of heroes who have lost limbs, primarily in Afghanistan and Iraq. He has talked hairstyles with Johnny Damon, sipped a margarita with Jimmy Buffett, met softball star Jennie Finch, played touch football at the Super Bowl against NFL veterans, and taken batting practice at Fenway Park. More important, he has inspired others through peer visits, blood drives, and just hard-nosed hustle and determination, both on and off the diamond. “He’s an inspiration to me,” said Josh Wege, a Marine lance corporal from Wisconsin who lost his legs below the knees when an improvised explosive device (IED) went off in Afghanistan. Wege says Reynolds is fearless, especially roaming the outfield, where he dives for anything within reach, sometimes getting a face full of turf for his efforts. David Van Sleet, founder and head coach of the team and a prosthetics manager with the Department of Veterans Affairs, says he heard about Reynolds from the VA medical center in Jamaica Plain. “They said, ‘We think this is what you’re looking for. He’s a real diehard. He gives it his all,’ ” said Van Sleet. According to Reynolds, the players drive each other. They are truly America’s Team, a collection of 15 heroes from all different parts of the country. Reynolds was raised in Dighton by a single mother who did her best to provide. On Sept. 10, 2001 — the day before the terrorist attacks — Reynolds asked his mom to call an Army recruiter. He enlisted when he was 17, and went quickly from baseball to Basra. He was in Iraq for his 19th and 20th birthdays. He watched the Red Sox win the 2004 World Series on Armed Forces Television and celebrated with cold beer in the hot desert. The troops even built a replica Fenway Park, complete with a Green Monster and Citgo sign, and Reynolds played Wiffleball in the 130-degree heat. And he fought the enemy, winning an Army Commendation Medal with Valor. He came home a changed man. Despite some concerns, he decided to do a second tour. Reynolds bought a racing motorcycle, a yellow Suzuki TL 1000R, and was visiting friends at Narragansett Bay on the warm Sunday afternoon of June 22, 2008. He called his house and told his grandmother he’d be home for the big ham dinner. He said goodbye to his friends and headed north. “That’s all I remember,” he said. According to Swansea Police, a 2004 Chevy Impala driven by Viera was exiting Interstate 195 and made a left turn in front of Reynolds, who swerved left to avoid it. He sustained broken bones in his neck, a brain injury, a punctured knee, and a ripped artery. His heart was exposed at the scene and he nearly bled to death, but an ambulance was nearby. Swansea Police Lieutenant Gregory Ryan was on the scene. Reynolds finally woke up in early August, trying to scream, but the tubes in his mouth made that impossible. Nurses would explain his condition to him, but he would doze off, and then not remember what they said. “It was like ‘50 First Dates’, ” he said. It angered Reynolds that he heard nothing from Viera. He was eventually sent to the VA Hospital in West Roxbury, where he was in a wheelchair most of the time. He was down to 110 pounds and felt like a POW. When he got home, he became a recluse. His mother stepped in to help. “She said, ‘Greg, just give yourself one year and try to make it work,’ ” he said. Her love sparked the gradual healing. Friends stuck by him. His anger dissipated. He penned a “veteran-to-veteran” letter to Viera. Reynolds’s buddies also came to the rescue. They organized “Help Greg Finish The Ride,” a charity motorcycle run in 2009 that completed Reynolds’s unfinished ride home. When he found out how much blood he had lost in the accident, he vowed to pay it back. He went to Bridgewater State College and earned a degree in criminal justice in December 2009. And he bonded with the Wounded Warriors. Like every one of his new teammates, he never thought he’d play ball again. Playing for Dighton-Rehoboth High School, the speedy Reynolds once started a triple play when he tracked down a blast to center field as runners circled the bases. Now he has developed his own catch-and-flip technique for fielding. After he catches the ball, he tosses it up, drops his glove, and bare-hands the ball to fire it in. Unlike former major league pitcher Jim Abbott, who had a forearm he could use for holding his glove, Reynolds has no support. He has no collarbone on his right side. That’s from doing more than 110 one-armed pushups a day, said Reynolds. He also had to learn to hit one-handed, which was complicated. Reynolds has a tracking problem in his right eye, so he has to hit lefty, meaning that every swing is a one-handed backhand. On the field, there is nothing but joy, win or lose. “We won before we started,” said Van Sleet, the coach. “They didn’t think they were going to live, they knew they weren’t going to walk, and they certainly knew they weren’t ever going to play a sport again. And that’s not where it ends. Reynolds also plays golf with trauma survivors and goes rock climbing. He visits veterans who have lost limbs. He is a US Paralympic hopeful in shooting. He gives motivational speeches at schools. “I wouldn’t have these opportunities if I wasn’t injured,” he said. He is also a fan favorite. Kids love the glove flip. “Blink and you’ll miss it,” he tells them. After the Wounded Warriors played a game against the University of Miami baseball team, 10-year-old Joseph Beard waited in line for an autograph. These days, Reynolds smiles easily. His favorite was a young boy at a game at Doubleday Field in Cooperstown who had had an arm amputated. That day at the Baseball Hall of Fame, the boy asked Reynolds for an autograph.